With its exotic scenery and fascinatingly diverse culture, Indonesia offers wonderful opportunities for adventuresome travel. Inexpensive transportation by bus and ferry, and clean, affordable accommodations make the country a haven for backpack travelers on a budget. 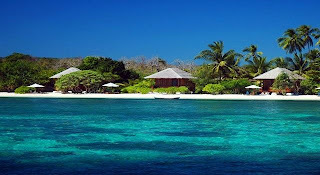 Because Indonesia is made up of nearly 14,000 islands, no traveler can see all of it. You’ll learn about the best places to go from other backpack travelers and from Indonesians themselves. But a bit of planning will help bring many of the most interesting attractions within your reach. When touring Indonesia’s western island of Sumatra, consider starting in the city of Medan. 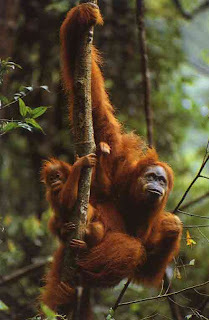 To the northwest of Medan, the Gunung Leuser National Park contains the Bohorok Orang-utan Rehabilitation Centre. An estimated 5,000 wild orangutans live in the park. You can find excellent, inexpensive accommodations near the park along the banks of the Bohorok River. At the losmen (guest houses) wild monkeys steal fruit from the verandas, and each morning a guide leads a short walk to a feeding site for the orangutans. 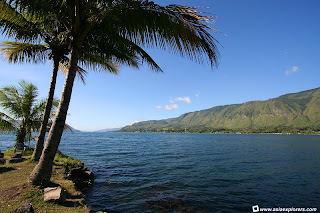 In the mountains south of Medan lies Lake Toba, a peaceful and beautiful volcanic crater lake. If you plan to go by bus southward through Sumatra, rest up at Toba before the long trip. During your visit, take a trip out to Samosir Island at the lake’s center to explore the villages. Just below the equator, on the island of Borneo, a tropical rain forest is rising out of a logged, charred wasteland. Dawn mists cling to the leaves of ginger and mango trees erupting out of a tangle of ferns, rattan and yam vines. A sparse canopy of white-barked acacias shelters them in filtered shade as the sun burns through the haze. From deep in the distance a tuneless chorus of gibbons booms over the clamor of cicadas, while a white-bellied sea eagle soars silently above. Surfers head for the long, western coast of Sumatra for its excellent surf beaches. Offshore, the Mentawai Islands feature consistently large swells. The well heeled can charter small coastal freighters that ply up and down the coast, anchoring seaward of surf-spots. After a few hours in the water the exhausted surfers return to the ship, to eat, drink, and socialize with the crew and less energetic passengers. With no railways on Sumatra, most budget travelers get around by bus. Anyone contemplating the long trip from north to south can expect a journey of more than 48 hours, assuming the bus does not break down (they regularly do). You’ll likely spend the journey squashed into a small seat, wedged between bound chickens and bags of rice, and surrounded by thick smoke from clove-scented cigarettes. Despite the hardship, this kind of bus travel brings you closer to ordinary Indonesians. Friendly local Indonesian travelers often invite backpackers to meet their families. Consider crossing the Sunda Strait between the islands of Sumatra and Java by ferry. While in the vicinity, take a side trip to Krakatau. 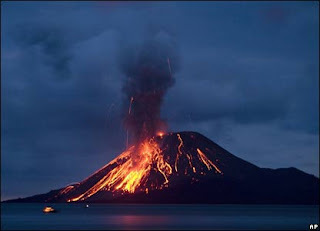 Krakatau volcano erupted in 1883 in one of history’s loudest and most spectacular natural events. The huge waves that the explosion generated inundated low-lying coastal areas of Java and Sumatra, killing tens of thousands of people. Much of Krakatau disappeared beneath the sea after the eruption, leaving a smaller but very active volcanic island, Anak Krakatau (“Child of Krakatau”).